Winter has come in full force to Prague (the sun is absolutely nowhere to be seen) and that means that our favorite Saturday morning routine of visiting one of Prague's many farmers' markets has gone on hiatus. The weekend markets take a break for a couple months to relieve the vendors/farmers from the frigid winter mornings and make sure they are prepared for when the frost is over and the sun can be seen again. We find ourselves going to our local market at Kulatak and immediately get in the long line for what I think is the best kolache, kremole, buchty (pictured above) in town baked by Cukrarstvi Karlovy Vary. Now Czechs aren't crazy about the cookie or brownie but prefer a flaky pastry and sweet bread that is usually packed with a poppy seed or milk curd filling. No complaints here. Even with our extremely limited Czech speaking skills, we find that people appreciate us trying to say, "Dva, prosím" correctly while pointing to some heavenly looking pastry and fumbling with our Czech Korunas. We are learning Czech very slowly as there are very few similarities between the Slavic and Germanic language structures, but we're doing our best and sticking with what we know best, ordering food, "Já si dám polévkou, prosím." Now after we have had our sweet breakfast we head to the green grocers where they show off their huge leeks, potatoes, apples, cabbages, turnips, peppers, and whatever other hardy winter fruits & vegetables make it through the frosts. We try to get to the market early in the morning so that we can see what the locals buy (equipped with dog and wicker baskets in hand) and where the biggest lines are before the tourists come. Who knew that the pickup truck with hundreds of eggs for sale, the mini dairy van, or the sausage tent were crowd favorites? 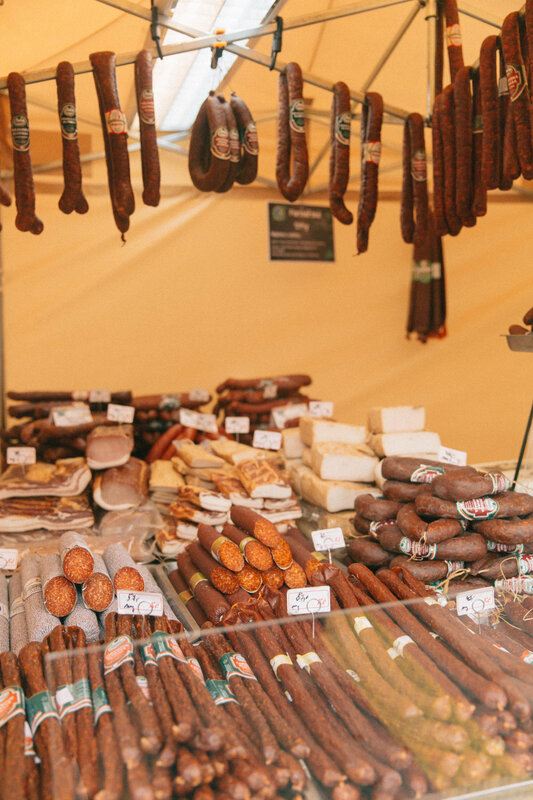 One of Kensey's favorite stops is a seafood tent that carries octopus, eel, tuna, or anything else you can imagine brought from the Baltic Sea or Dalmatian Coast right to the center of Prague. It's been such a fun adventure to experience all of these new tastes and smells that are so unique to this part of the world. I HAVE TO WAIT HOW MANY WEEKS FOR SOME MORE CHORIZO TOAST?